Opening, removal and restitution: why the 1980’s? This essay was written for the roundtable discussion entitled Why the 1980s? proposed by L’Internationale whithin the framework of the cycleWhen Were the 1980s? 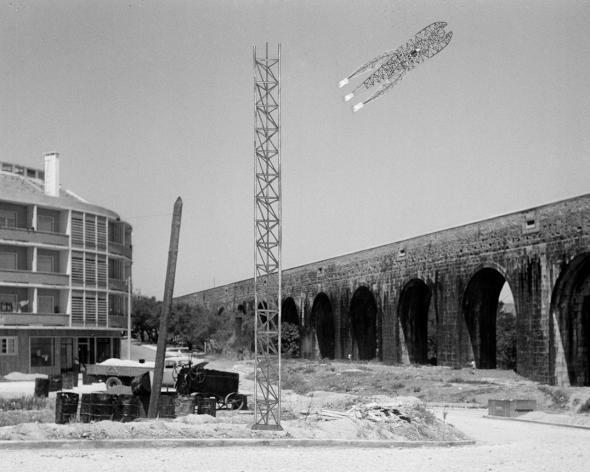 curated by Luís Trindade, Ana Bigotte Vieira, and Giulia Bonali and organized by Instituto de História Contemporânea in Lisbon from 10 to 21 April 2015. The general purpose of the debate, one of the last sessions of the cycle, was to reflect on the contemporary readings of the 1980s from the perspective of the projects each panellist has been undertaking, drawing parallels and differences among them.Not being able to establish an overall perspective of the cycle, which was still running, I tried to bring to the forefront some of the reasons that led When Were the 1980s? to address this periodization as a question, followed by some examples that suggest that it is difficult to place the Portuguese 1980s exactly between 1980 and 1989. From today’s point of view, the ‘OPENING’ moment identified in all three works could be seen to correspond with the ‘Long 1960s’, its emancipatory impulse and set of practices, and the ‘REMOVAL’ moment could be read as a result of the decline of possibilities usually related to neoliberal politicies of the 1980s. But in all three works, the periodization seems to exceed linear chronology. It is therefore our intention to bring this very periodization under scrutiny, in order to disclose potentialities for the present, in a critical, non-nostalgic approach. Back To The Future In Back to the Future I, after Marty McFly finishes a wild guitar performance, at the party where his parents dance for the first time, he notices everyone staring blankly at him and says: “I guess you guys aren’t ready for that yet… But your kids are gonna love it.” He had just prefigured rock ‘n’ roll music.2 In Robert Zemeckis plot, McFly, the hero, travels back and forth in the chronology, going back to the past, so that the future can be unwrapped. In a less epic tone and with a dispersed multiplicity of agents rather than one single hero, such was (if you can allow me to be a little daring) one of our desires when opening up this reflection. What if we were to think back to thirty years ago? But the plot thickened rather quickly. Not only from a chronological perspective, the 1980s seemed inextricable from the period coming immediately before, the 1960s – or the ‘Long 1960s’ -, but also, from a geographical perspective they would entangle different meanings. 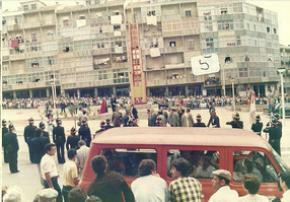 And what about the specific Portuguese case, where a long-lasting dictatorship and more than a decade of colonial wars were overthrown by the coup of 25 April 1974, giving rise to the eighteen month-long revolutionary process in 1974-75, soon interrupted by the counter-coup of 25 November 1975, with European Economic Community and NATO in the horizon? Unlike Marty McFly for whom the perplexity of the audience staring at him could be answered with a simple “I guess you guys aren’t ready for that yet” (that being rock music), the challenge was precisely not to tell one single story through a narrative of backwardness and behind-ness – a story with central points emanating from unwavering developed centres – but to try, instead, to understand the past as a territory built from a multiplicity of negotiations and struggles, a time span traversed by tensions. But let’s go back to Back the Future. The second part of Marty McFly’s injunction – “I guess you guys aren’t ready for that yet… But your kids are gonna love it” – alludes to rock ‘n’ roll and suggests, by contagion, the rhythmic resonance between de-ordered people dancing, paving the way for a place where the collective desiring body plays a central role: TO LOVE. Rock and pop, advertising, fashion, market, well-being, colour television, youth, postmodernism, audio-visual, sexual freedom, multiculturalism, Europe; and at the same time depoliticization, cavaquismo3 , depression in the rural world, uncontrolled growth of the outskirts, racism, corruption, social discrimination, pollution, anti-intellectualism, consumerism… On the one hand, the logic of abundance that can be found at work in the 1980s (and in the Portuguese 1980s, in particular) seems like an opening – disclosing potentials for the creation of emancipated desiring subjectivities. On the other hand, it definitively also appears like a closure – subsuming the possibilities of reality to a neoliberal order; an order interested as much in the atomisation of collective desire for consumption purposes, as in the removal of the traces of the recent revolutionary years marked by collective agency. OPENING and REMOVAL can be considered as central operations to think about the time span addressed here. But again, which time span are we talking about? When were the 1980s? I would like to illustrate this question by focusing on three works where an effort to deal with these two operations is at stake, in order to end up with a brief description of the reasons that lead us to propose this cycle – a public collective reflection on the 1980s understood as an interrogation. By doing so, I am invoking a third operation: DEVOLUÇÃO (RESTITUTION). This can be read in three ways: DEVOLVER in Portuguese can mean to give something we do not like back; DEVOLVER meaning to have back, by restitution; and DEVOLVER as the substance of transmission, an ingredient of the experience of partaking. The three works discussed here – from different periods, but all (re)visited today, in 2015 – share with the cycle When Were the 1980s? the investigation of the limits of public space and collective agency, having the public sphere as an imagined community and inquiring into something that can be thought of as commons: common memories of common practices, memories and practices that can become part of a common imaginary and help illuminate a certain repertoire of actual practices. 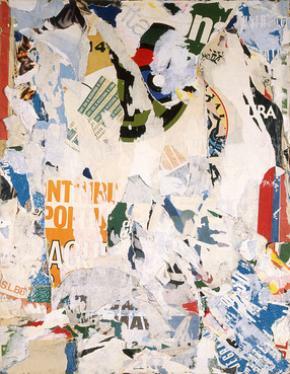 In As Ruas de Lisboa, an artwork dating from 1977, visual artist, writer, poet and professor Ana Hatherly4 condenses some of the discursive and political effervescence that took place in Lisbon during the revolutionary process of 1974-1975. 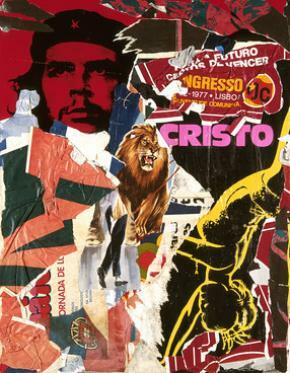 This effervescence – inseparable from the local and global contexts in which the Carnation Revolution took place, directly related to the African anti-colonial struggles and closely connected with other European processes of social rebellion – attests to the vivacity of the profound social mobilisation and international forms of activism triggered at the time. By offering us a portrait of the Lisbon walls in 1974-1975, focusing on the everyday life of the revolutionary process, Hatherly’s work places this moment in “wider linkages to the radical moment of the long 1960s, the Cold War, African anti-Imperialism, and the memory of Revolution in the twentieth-century at large.”5 In this sense, As Ruas de Lisboa can be seen as bearing witness to a discursive and political opening, a disclosing of possibilities only made possible by a brutal interruption in the course of history, in a Benjaminian way. Researching how the Carnation Revolution had altered the public space, namely in statuary, artist Isabel Brison (who was born in 1980) realised that, astonishingly enough, very few monuments have been replaced or removed. Reverting instead to monuments commemorating the Portuguese Revolution, she found a reproduction of the Águas Livres Square Monument on the Damaia Roundabout in a book. 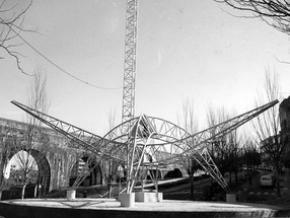 The monument, dating from 1985, was acknowledged as “unknown collective authorship”. A highly industrial metallurgical area in the 1970s and 1980s, Amadora is one of the biggest cities on the outskirts of Lisbon, and one of the most densely populated municipalities in the country, with 175,136 people in an area of 23.78 km². Damaia is a suburb of the city of Amadora, which at the time had only been a city for six years. In 1985, Amadora had been, for almost a decade by then, a communist municipality with a solid trade-unionist tradition in metallurgy, due, among others factories, to SOREFAME, a now extinct company specialised in building train carriages and heavy machinery. SOREFAME workers made the Águas Livres Square Monument in their spare time, for the communist party’s annual festival in September, Festa do Avante!,6 and they then brought it to Damaia’s Águas Livres roundabout in December of the same year. In the same period, as she also came to know, the same group of unknown workers also built another monument, an Homage to the Fireman, and a series of playgrounds for children and street furniture, all made in metal, as the recently born neighbourhood lacked urban planning. Alongside the constructivist aesthetic of the monuments themselves, uncannily peculiar in the Portuguese statuary landscape, it is worth highlighting that these artworks were made collectively by absolutely unknown artists animated by ‘revolutionary spirit’, with the will to improve the newly born city of Amadora. But I would like to call attention to the chronology: workers are spending their spare time collectively making artworks and infrastructures to improve their neighbourhood in 1985, one year before Portugal became a member of the European Economic Community? Wasn’t it in 1975, during the revolutionary process, when people were occupying lands and factories and organising themselves into neighbourhood committees? 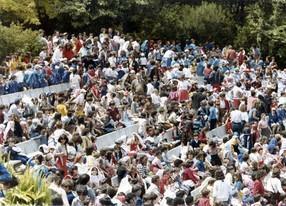 How come is that possible that this happened in the middle of the 1980s? CAM and ACARTE can therefore be said as being intensely desired by the artistic community who had been longing for a museum, rather than creating a rupture with such an institution as the modern art museum.8 And consequently, due to the fact that the museum was only built in the 1980s, several temporalities seem to be at stake in CAM and ACARTE: Schematically (and risking some imprecisions9), CAM and ACARTE could be seen as a promise coming from the 1950/60s; placed in a cultural centre corresponding to a structuralist architectonic archetype from the 1970s (such as the Centre Pompidou in Paris); which opened in the 1980s (when Jean Baudrillard had already written his highly critical Beaubourg effect10); hosting the ACARTE Department, whose curatorial approach – mainly focused on performance, dance, theatre and a series of relational events where presence and performance were at stake – could be seen as prefiguring the curatorial discursive and performance turn of the 2000s. ACARTE can also be thought of as the culminating point of two decades of research on Education Through Art and Artistic Education. Its founder and main Director Madalena Perdigão not only founded the Gulbenkian Orchestra (1962), the Gulbenkian Chorus (1964) and the Gulbenkian Ballet (1965), but was also responsible for the reform of the national conservatory schools and for a failed reorganisation of the national artistic education after the Revolution. 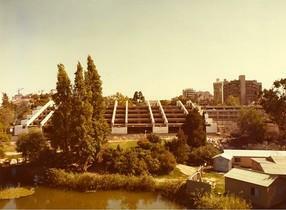 In fact, there is an intricate history linking the radical experiments in arts pedagogy prompted by the Gulbenkian Foundation’s Centre for Pedagogic Research before 1974, Madalena Perdigão’s failed efforts while working at the Ministry of Education shortly after the Revolution, and her return to the Gulbenkian Foundation as ACARTE Director in the 1980s. 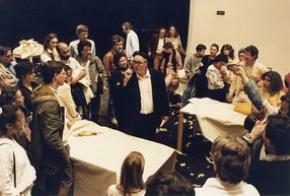 In this regard, ACARTE’s activities in the 1980s are directly related to the ‘Long 1960s’ emancipatory experiments in pedagogy. But not exclusively. ACARTE’s activities can also be looked at from the point of view of curatorial practices, or, more accurately, as being at the crossroads between emergent curatorial and programming practices, conjoining both. Perdigão proposed what I would call ‘Curadoria da Falta’, for ACARTE’s often based its activity on the need to attend to what is missing (faz falta) – thus developing a particularly attentive way of moving through aesthetic and political-philosophical proposals usually attributed to different time spans. ‘Curadoria da Falta’ means something like ‘curating what is lacking’. Literally, falta stands for ‘lack’, but it can be understood as ‘missing’ – as in my interpretation of the ‘School of Missing Studies’ project, by the collective BikVanderPol and friends, concerning interdisciplinary studies that still have to be located and undertaken. In fact, ‘Curadoria da falta’ takes lack as something constituent for the community, as openness to the other, in the sense Roberto Esposito describes it, and not as something derogatory, proof of scarcity and backwardness. By ‘Curadoria da Falta’, this Department’s activity opens up to the different perceptions its contemporaries had of their own time. As such, ACARTE is a superb case study with regards what concerns chronological folding, eccentric chronologies and decentred modernities. ACARTE 1984 Almada Negreiros 'Deseja-se Mulher', text Almada Negreiros, director Fernanda Lapa (Sala Polivalente), Prodution ACARTE. Courtesy Calouste Gulbenkian Foundation archiveThis has led me to describe ACARTE as an Aleph, a comparison that came up in an interview with art critic João Pinharanda.11 An Aleph, according to Jorge Luís Borges, is “the only place on earth where all places are – seen from every angle, each standing clear, without any confusion or blending” (Borges 1945). 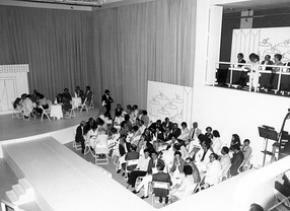 There is both a heterotopic sense of the museum space (Foucault 1967), and an acute perception of ACARTE as belonging to the exhibitionary complex (Bennett 1995), a set of institutions where a particular kind of subjectivity would take shape through repeated practices and widespread discourses. In fact, in the Portuguese 1980s narrative, ACARTE could be placed alongside emergent phenomena such as the Lisbon nightclub scene at Bairro Alto (with places like the cosmopolitan disco Frágil), or urban consumption materialised, for instance, in the Amoreiras Shopping Mall, which opened one year after CAM. Contradictorily enough, ACARTE’s activity could also be understood in direct relation to the Carnation Revolution of April 1974 – as a modern art museum was one of the late fulfilled ‘April promises’. Thus, if on the one hand the ACARTE Department proposed a series of disparate events such as Contemporary European Dance, Spoken Newspaper of Literary Actuality or Quinzena Multimédia, to name but a few – gathering in an heterotopic fashion heterogeneous places and times in one single space – on the other hand its activities happened in articulation with a network of spaces for leisure, work and consumption – the ‘exhibitionary complex’ where one would see and be seen, and new subjectivities would arise. 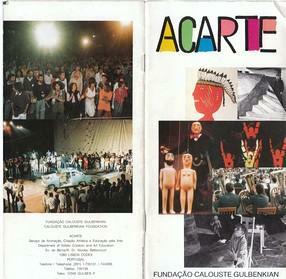 ACARTE 1985, Exposição-Diálogo Sobre Arte Contemporânea, 1985. Wolf Vostel, O Jardim das Delícias.foto de Eduardo GageiroApproaching CAM/ACARTE as an Aleph, allows for a particular non-linear reading of the set of tensions enacted by the opening of such spaces. It could be particularly useful in order to address the museum as a place that simultaneously works as an enunciator for society at large and something that is practiced (adapted, cheered, contested…) by its members. Bearing these three examples in mind, let’s go on to the second operation “REMOVAL”, so that the argument can proceed. I will present three different ways of enacting this operation: to wrench, to dismantle and to extinguish.